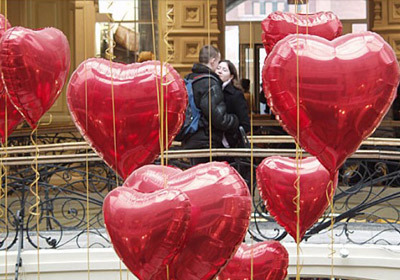 Valentine's Day is one of the youngest holidays in Ukraine. All lovers celebrate it on February 14th. Mass Valentine's Day has been celebrated in Western Europe and in the USA since the thirteenth century. In Ukraine - only since the beginning of the 90s of the last century. The Catholic Church on this day honors the holy martyr Valentine, who is considered the patron saint of lovers. According to legend, St. Valentine was born in the III century AD in Rome. Emperor Julius Claudius II forbade Roman soldiers to marry, but priest Valentine still secretly crowned lovers, and this earned the death sentence. While awaiting execution, he fell in love with the blind daughter of the prison guard and left her a letter before his death. According to one version, this is the very first Valentine in the world healed a girl. Valentine was executed on February 14, and two hundred years later they were recognized as saints. The classic emblem of Valentine's Day are red roses and "Valentine", which appeared in the XV century. Her invention is attributed to the Duke Charles of Orleans, who, fighting in prison with boredom, wrote love letters to his wife. By the XVI century, "Valentine" gained great popularity. Nowadays, "Valentine" is quite possible to send an e-mail. In 2019, Valentine's Day falls on Thursday. On this day in many cities of Ukraine concerts, beauty contests, exhibitions will be held. Exhibitions of violets are traditionally held in Kiev on these winter days. Last year, it was possible to admire the beautiful indoor plants and buy everything for their cultivation at the National Science Museum of the National Academy of Sciences of Ukraine (the Archaeological Museum), as well as on the territory of the Kiev city resort balneological bath Darnytsya. Interestingly, a portion of the relics of St. Valentine are stored in Ukraine - in the Church of the Nativity of the Blessed Virgin Mary of the city of Sambora in the Lviv region. The authenticity of the shrine confirms the document of the Pope of 1759. Every year on Valentine's Day hundreds of pilgrims come to this Greek-Catholic temple: happy couples, lonely skeptics and unrequited lovers. On this day, the shrine with the relics of the saint is transferred to the tetrapod for universal worship. In the church, prayer services are held for Valentin, after which believers can touch the shrine. On the central square of Sambora on this day the St. Valentine’s Festival is usually held with a concert, a fair and flash mobs. Also popular in 2017 was the "Shop of Lovers".